If you also like scouts you should take a look at this game, it highlights the impressive strength of a scout army and why stun chaining should be looked into by Relic. Basically they are expandable, you can bleed them and never reinforce them only via T3 banner healing or Gab drop pod healing presence doctrine. 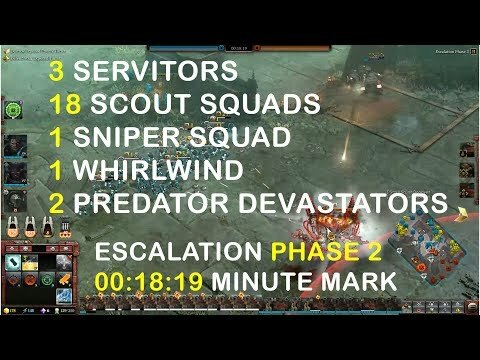 The main goal is to have as many squads available so you can stun chain, in this match I manage to get 18 squads at the 18 minute mark, paired with 2 predators devastators, 1 whirlwind, 1 sniper squad and 3 servitors. I have also invested in scouts mines and 2/2 upgrades until the 18 minute mark ensuring that I`ll have a smooth transition into late game SM predators devastators paired with the Paladin. I`m just curios why aren't others starting to use scouts? I know in 1v1 some of the players that I have defeated with this in SM mirror started to adopt this, but it works wonders in 2v2 and 3v3s also. This build feels very cheezy thats why people might not want to use it. All it is is someone milking a mechanic that is OP when spammed. I'd never risk using it in 3v3 unless I know ppl I'm playing with, because if I left on the lane defending it alone, I'd be stomped. In 1v1 it proves useful though, but I can't bare to play with single unit composition and even then Scout spam is extremely micro intensive. You have to keep them apart all the time and avoid blobbing at all costs or they die with single nuke. Stunlock is pretty useful though. This build actually got me rank 1 in 2v2 and 3v3 random team. But it requires a good amount of micro management to pull it off and as @CANNED_F3TUS said it`s also milking a game mechanic that is OP when spammed. But its good that you made video! Will give Relic good feedback. Does anyone know how to refill a squad's cluster mines? I always have some scouts fielded, but i found a mixed army to be more effective with scouts stunning high priority targets, that usually doesn't last longer than 2 stuns when getting mowed down by a strong army. There's truly alot of couterplay against theses scouts... a few devastator units+banner+1-2 ASM and your whole army is gone. You wouldn't even manage to get the devastators stunned long enough for the scouts to kill them.